When I was little, the Emporium-Capwell in downtown San Francisco had a holiday carnival with rides on the roof, and at one time even had an indoor ice skating rink. The carnival was a really big deal in the 40’s and 50’s, but by the time we were born, it had lost its luster and wasn’t as grand as it had once been, and the carnival closed completely in 1995, which was Emporium-Capwell’s last year of business. 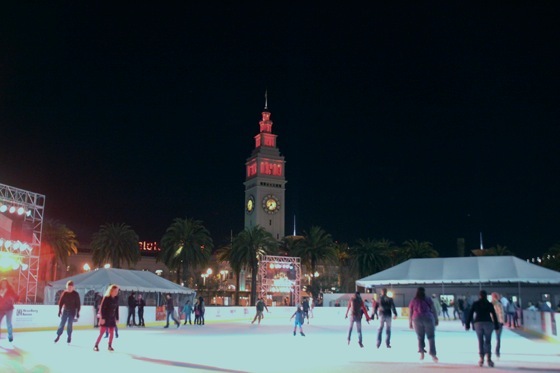 Although I never got a chance to go ice skating at the Emporium, there was a holiday ice rink that would open up at The Embarcadero for the holidays when I was a bit older. 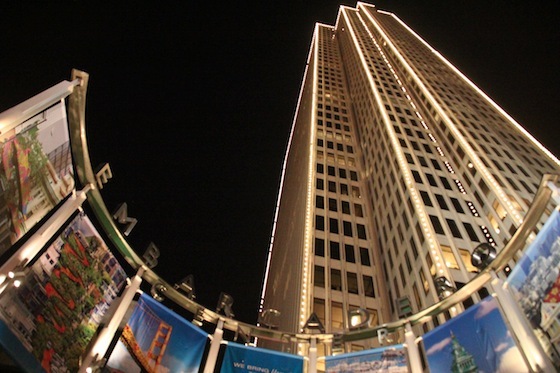 The Embarcadero ice rink is San Francisco’s largest outdoor ice rink, and has been set up every holiday season, for its limited two-month engagement, for over twenty years. In middle and high school, my friends would go to skate, either on field trips with their schools or for random birthday parties, but I never got a chance to go. When Nick and I went to New York last year, we had thought about going ice skating at Rockefeller Center, but the crowds were crazy and the lines were so long. We decided taking it all in (without getting on the ice) was good enough. Besides, I kind of really wanted my first outdoor ice skate to be at my hometown’s holiday rink. So, tonight Nick got out from work a little early and we drove down to the Embarcadero. The ice rink is set up in Justin Herman Plaza, right next to the Vaillancourt Fountain. 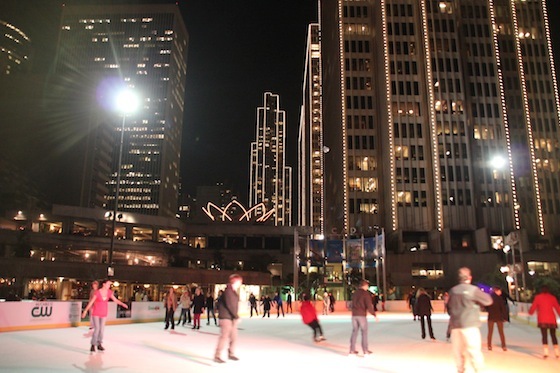 At night, the lights of the Embarcadero buildings and the Ferry Building are beautiful, and the rink is such a festive way to enjoy the holiday atmosphere. Skating sessions are 1 1/2 hours long, and begin every even hour. It’s only $9 to skate, and $3.50 to rent skates. Not bad for such a beautiful setting, if you ask me! We had fun skating at the Embarcadero holiday ice rink. It wasn’t too crowded, although it was a Thursday night, and toward the end of its run (it closes January 8th this year). I’m really glad we finally got a chance to do this. I’d like to come back again during the holiday season of 2012!